The White Rose (die Weiße Rose) was an anti-fascist resistance group in Germany 1942-3, initiated by students in Munich. 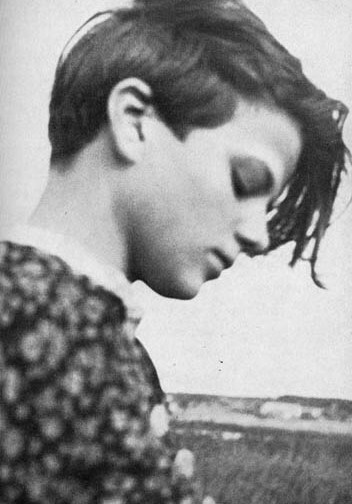 A number of its members were beheaded in February 1943 for distributing leaflets calling for the overthrow of Hitler, including Sophie Scholl (pictured), her brother Hans Scholl, Alex Schmorell, Willi Graf, Kurt Huber and Christoph Probst. The film Sophie Scholl - The Last Days starts with Sophie listening to swing on the radio, and music was an important part of the lives of those involved. Hans Scholl had joined an underground anti-nazi youth group in 1937 called d.j.1.11 (the German Youth of November 1 1929): ‘The group’s members developed attitudes and styles that would set them clearly apart. They were not nationalistic; and unlike the earlier Wandervogel, they preferred hitchhiking to tramping. For their group's name and in their writings they used lowercase letters, a modernist style reminiscent of the Bauhaus movement in art and architecture, and one that was reviled by the Nazi establishment. They sang Balkan folk songs, even American cowboy laments, played the Russian balalaika, and devoured banned literature’. Conscripted to the Russian front as medics in 1942, Hans Scholl, Schmorell and Graf sneaked away to fraternise with the locals in farmhouses where they ‘sang folk songs, joined in the dancing, and provided the local people with schnapps and medicine’. Graf wrote: ‘In the evening we listen to Russian songs at a woman’s house. She works in the camp. We sit in the open air, behind the trees, the moon comes up, its rays falling in the spaces between the rows of trees, it’s cool, the girls sing to the guitar, we try to hum the bass part, it’s so beautiful, you feel Russia’s heart, we love it’. In Hamburg jazz and swing had the biggest impact. A friend of the Munich group, ‘Traufe Lafrenz went home to Hamburg, bringing with her a batch of White Rose leaflets to show her old friends Heinz Kucharski and Greta Rohe. Like the Munich group these young people and their friends met regularly to discuss the arts and the dismal state of affairs. Unlike the White Rose, however, they were aficionados of American swing and jazz. This kind of American music had a secret, cultlike life of its own in Nazi Germany among certain groups of youths. Because it was officially frowned on and prohibited as a “racially inferior product” of the Afro-American blacks it exerted a magnetic allure. Its free rhythms, its wild expression of feeling in sound, and its erratic and improvised beat charged up young people and drove them to find records, listen to them together, and become almost embryonic cells of conspiracy’. It was from this milieu that the Hamburg branch of the White Rose emerged. Seven members of this group were executed, although Kucharski managed to escape from a train on the way to the execution site in the last days of the war. Source: Sophie Scholl & The White Rose - Annette Dumbach and Jud Newborn (Oxford: One World, 2006). See also dancing under the Nazis in France.